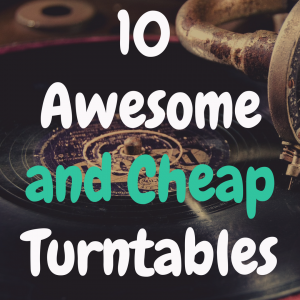 In this article, I’m going to examine the Crosley C100A record player. 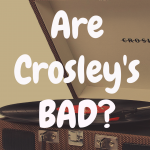 Is it really worth the money, or is it true that Crosley record players are bad for beginners? Well, that’s what I’m here to find out in an effort to help you figure out if this is a record player worthy of your consideration. Because this isn’t necessarily your typical Crosley record player. In fact, the C100A is not a suitcase record player, nor does it have built-in speakers. This baby is attempting to match some of the more sophisticated beginner players on the market, thanks to an S-shaped tonearm and a counterweight to prevent record scratching. 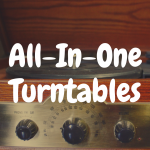 In an effort to help you figure out if this is the right turntable for you, I’ll also take time to compare the Crosley C100A to the C200A and Crosley C10A, as well. When shopping for your first turntable, it’s important to know the basic setup. 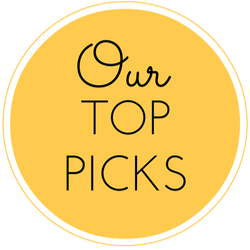 This way, you’ll be able to tell the quality of the manufacture, and if there are missing components — like a cueing device or counterweight, both designed to prevent record damage. The materials of which the turntable is made are important as well; a carbon fiber tonearm will perform way better than a plastic tonearm, which can even damage your records if it’s too short (like in the Crosley Cruiser series). Dust Cover: It’s placed on top of the platter and prevents dust from collecting and damaging your records. Plinth or body -base of the turntable: When setting up the turntable on any surface, it’s very important to level it properly. This helps make sure that there is no leaning towards any side.The needle must track both sides of the groove perfectly, and if the turntable isn’t leveled correctly, the needle will track heavier on one side and there will be distortion and possible damage to the grooves. Tonearm: Supports the cartridge and allows it to move smoothly across the grooves. It has a counterweight, which balances the tonearm and controls tracking force (weight the record needle). Cartridge: Holds the stylus (needle) and converts the movements into an electrical signal. Different cartridges require specific tracking forces, measured in grams (usually set between 1.5 and 2.5) If this sounds confusing, don’t worry, the instructions for calibration are usually included in the manual. Platter: Spins and supports the record. Motor: Allows the platter to spin. There are two kinds of motors: direct drive and belt drive. The C100A uses a driven belt mechanism which spins the platter using a rubber belt. Direct drive motors (like in the C200) are hidden under the platter and don’t use a rubber band. Record Matt: Sits between the platter and the record, reduces vibration and prevents the metal platter from scratching the record. Stylus or Needle: Tracks the grooves on the records. Anti-skate: The needle has a tendency to go to the center of the record, the anti-skating device prevents that from happening, normally it must be set to the weight of the needle. Cueing device: Prevents lateral movement that can scratch the record. Inspired by the design of the Technics Sl-1200 1970’s turntable, the Crosley C100A looks elegant and stylish, with a nice vintage appearance and a sleek design. If you compare it to the Cruiser series, the C100A is definitely an improvement for Crosley. While the Cruiser has no anti-skate system, no height adjustment and many more flaws, the C100A offers counterweight, cueing and anti-skating device. One of the biggest downsides of this turntable is the overall thin sound and lack of bass presence; even if you hook it to a phono preamp and a good set of speakers, the sound quality is noticeably low compared to record players in a similar price range, such as the Fluance RT-81or the TechPlay TCP4530 analog turntable. Both of those have better audio quality than the C100A and cost almost the same. I would recommend checking out the Fluance RT-81, not only because it has better materials and construction, but the sound quality is noticeably better than the C100A, even when playing with the built-in preamp. The build quality of the C100A is rather feeble; although it looks like a Technics Sl-1200, the chassis is built out of ABS plastic, which is resistant, but not as much as the aluminum chassis other turntables in that price range have. Plus, the light weight of the ABS makes the turntable prone to vibration and therefore distortion. The C100A uses a high-quality Audio Technica cartridge and does have an anti-skate device and counterweight at the end of the tonearm- so you don’t have to worry about groove damage. There is not a lot of room for upgrades, since the cartridge and the stylus are of great quality- in fact, those are probably the best features of this turntable. Adjustable pitch control-which is a nice gimmick but it has no useful application in my opinion. Better sound than the previous Crosley Cruiser series. Poor sound quality-probably the biggest issue with this turntable. Weak built-in preamp, must be plugged to a phono preamp to produce a better sound. The Crosley C10A features a design and construction that’s significantly higher in quality than the C100A. But, it’s going to no doubt cost you more money. So, really, this is going to be a personal decision. 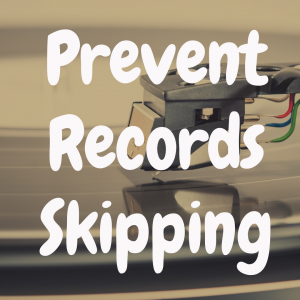 Do you love vinyl enough to pay over a hundred more for a wood plinth, or a pre-mounted Ortofon OM5e cartridge, or a motor contracted to reduce vibration? 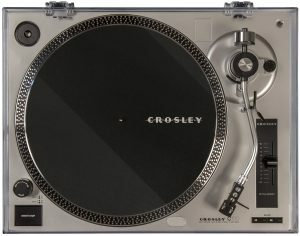 The Crosley C200A is, in my opinion, the best quality turntable Crosley has ever made (taking into account that the C10A was designed by Pro-Ject, not by Crosley). 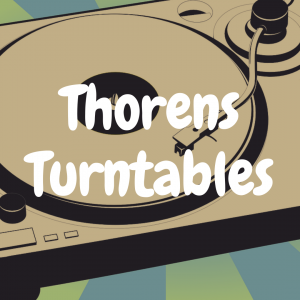 It’s not a professional turntable, but if you want a solid beginner player that is direct-drive rather than belt-driven, this might be the table for you. There is a lot of debate as to whether a direct drive or belt-driven turntable is better. 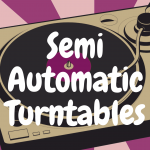 Many like belt-drive turntables, although you will eventually need to replace the belt manually whenever it begins to wear out or snap off outright.Also, note here that both the C200A and C100A play at 33 and 45 RPM. Although Crosley’s efforts to produce a high-quality turntable are respectable, with the C100A they fall short in terms of sound quality, durability, craftsmanship and reliability. It’s not a terrible turntable given Crosley’s track record—you could argue it’s one of their better ones. But, given its price point, you could opt for something like the Audio-Technica AT-LP60 or AT-LP120 and be fairly happy. Still, I also try and look at the target audience when reviewing record players. And, I think if you’re on a strict budget and you’re relatively new to record players, this is a fine jumping off point. I think, however, that if you already have a record player, or maybe you have an old, non-working turntable and want something new, there are better options on the market than getting the C100A. What are the Best Powered Speakers?